The long-anticipated relaunch of MSNBC as a straightforward news network and extension of the NBC News brand will begin in earnest over the next few weeks. 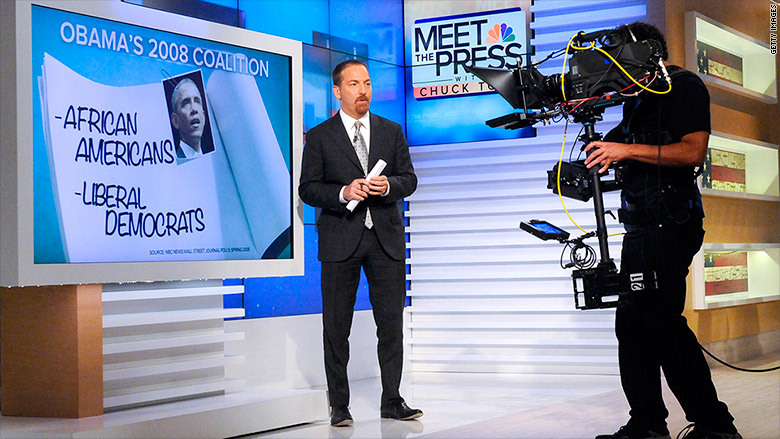 On Thursday, MSNBC president Phil Griffin announced that "Meet the Press" moderator Chuck Todd's new weeknight show will begin airing on September 28. The show will be called "MTP Daily," an extension of Todd's Sunday morning "Meet the Press" program, and will be televised on the same set as that program. Griffin also announced that NBC News national correspondent Kate Snow will assume afternoon hosting duties for MSNBC, anchoring coverage from 3 to 5 p.m. weekdays. Snow was also promoted to anchor the Sunday edition of "NBC Nightly News." And as previously reported, Brian Williams, fresh off a six-month suspension, will begin his new role as breaking news anchor on MSNBC on September 22, the day Pope Francis is scheduled to arrive in the United States. Williams will not have a regular time slot, but he will appear solo and with other anchors when there are big, rolling breaking news stories. The long-expected changes are the clearest sign of NBC News and MSNBC chairman Andrew Lack's intent to ramp up the integration between the network's news division and its cable news arm. Since July, Lack has canceled three of MSNBC's most opinionated daytime shows and moved the outspoken liberal host Al Sharpton to weekends. Lack's belief is that straight-forward newscasts will generate stronger ratings during the daytime, when the channel has struggled to hold onto an audience. One executive described the approach this way: 9 a.m. to 5 p.m. is news-oriented, 5 to 8 p.m. is "analysis," and 8 to 11 p.m. is "opinion." Anxiety about all the changes remains high inside the channel's halls, but the schedule seems to be solidifying. Progressive prime time hosts like Rachel Maddow and Lawrence O'Donnell seem safe. Right now the biggest hole in the channel's schedule is 6 p.m., which is about to be vacated by Sharpton. A political panel program is one possibility for that hour, leading into "Hardball with Chris Matthews" at 7 p.m.
Griffin indicated in an internal memo that more announcements are coming soon. He also announced a restructuring of producer responsibilities, putting one person in charge of all the morning newscasts and another in charge of the afternoon. Pat Burkey will be the afternoon boss, which is noteworthy because he comes to the cable news channel from "NBC Nightly News," where he was Williams' executive producer. Williams is likely to appear frequently in the afternoon hours, but Burkey will also oversee Snow and Thomas Roberts' scheduled news hours. In his memo, Griffin said that Burkey had "an incredible run at Nightly -- leading the flagship broadcast through four straight years as number one in all categories in a very competitive field."